Today I’m going to show you a selection of best party food cooking hacks 2017 to help you with party food. 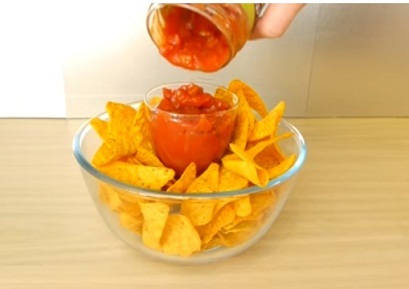 If you’re in a party serving crisps and a dip, instead of just opening them up and leaving them on the table, you can take a bowl and place a drink glass inside. Fill the bowl up with your crisps or chips as you call them in America, and be careful not to get any in the glass. Then open up your dip and pour it into the glass. It looks great and it’s a really nice way to serve it all together. 2.Easy way to make potato wedges When you are home alone. 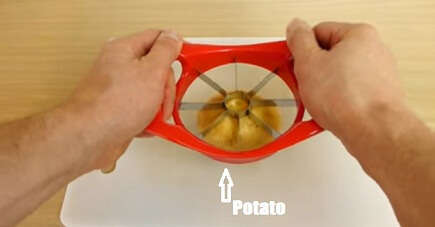 the second party food cooking hack is If you want to make your own potato wedges, you can use one of those apple corer and slicers. Place your potato on a chopping board, and cut straight down. It’s quick and simple and it makes the perfect wedges. But you might have to push them out from the bottom. If you like, you can chop the middle core in half with a knife, but I generally like to keep them as they are. Place them on a baking tray, and make as many as you like. It’s ideal if you’re doing lots of potatoes. Easy way to make potato wedges When you are home alone. This spray oil is really good for wedges because it means you can give them a nice light coating. Dust over any spices you might like. 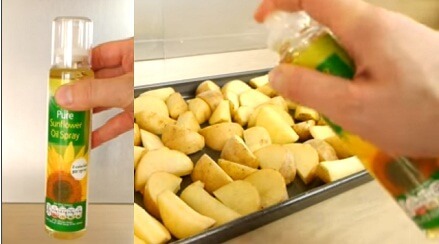 oil spray to make potato wedges When you are home alone. I’m using paprika and a pinch of salt. Bake them in the oven until they’re nice and golden and cooked all the way through. 3.Heating too much food in a small oven. 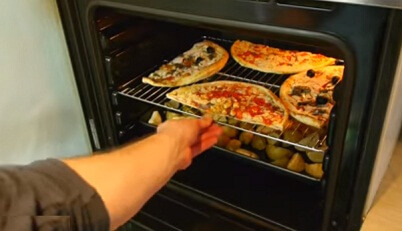 If you’re also serving a couple of pizzas, And you find there’s not enough space in the oven to fit them both in properly,the party food cooking hack is to Put your pizza on a chopping board, cut it in half, and place it on an oven rack . Do the same with the other one, And you can see there’s plenty of space for them to cook properly and they don’t overlap. When they’re cooked, you can put the two halves back together, cut the pizza as normal, and serve it on a plate. When your wedges are golden and cooked all the way through, put them on to a plate or a bowl. 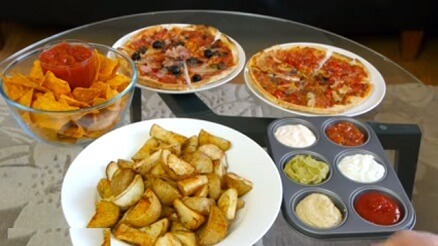 And to accompany your wedges, you can use a muffin tray to serve a selection of dips and sauces. These tips are great finger food for a party. 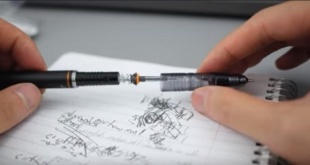 They’re quick and simple, and really easy to do. The muffin tray means you don’t need different jars of dips all over the table, and it keeps it nice and neat. 4. A Really Quick Watermelon Dessert. If you want a really quick and simple light dessert, you can serve a watermelon. You may have seen me do this trick before but it’s a really good one for parties. Put your melon on a chopping board and slice it clean in half. 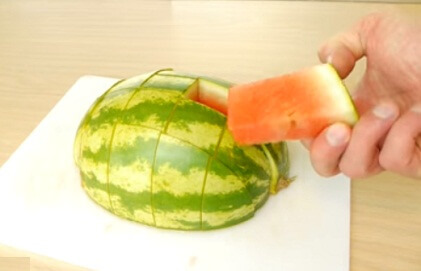 Lie it down flat, And use your knife to put slices all the way across the watermelon. 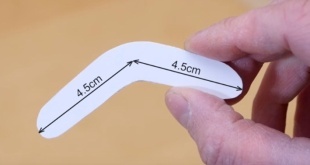 Turn it 90 degrees, and do exactly the same again slicing it in both it’s length and width. Try to keep all the pieces together. And that’s your melon, ready to serve! People can just pull out a piece, and it’s ready to eat. Pretty cool huh? 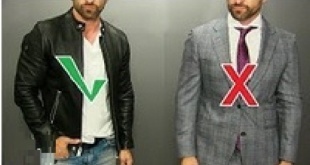 I hope you’ve enjoyed this post, if you want to see more, you can click on the links on the right side to discover move awesome posts & food tips, and also share this with your friends. Stay safe, have fun! And as always, thanks for visiting us back!